In this week's episode David, John and Kyle discuss everything from the Disney+ announcement including some of their new original series and if Apple TV+ should be worried (2:20). We also discuss the ongoing battle between Netflix and the Oscars including how Netflix is now buying a historic theater (16:20) and how the Justice Department is giving the Oscars a legal warning (19:05). Finally, we review the series premiere of Fosse/Verdon entitled “Life is a Cabaret” (22:40) and the season 8 premiere of Game of Thrones entitled “Winterfell” (34:10). In this week's episode David, John and Kyle discuss the record breaking ticket sales for Avengers: Endgame and how much some fans are buying tickets for on eBay (1:45). We also discuss some creative marketing for Game of Thrones including an iron throne scavenger hunt and the Bleed #ForTheThrone campaign (12:40). Next we review the first two episodes of Barry season two entitled “The Show Must Go On, Probably” and “The Power of No” (20:40). 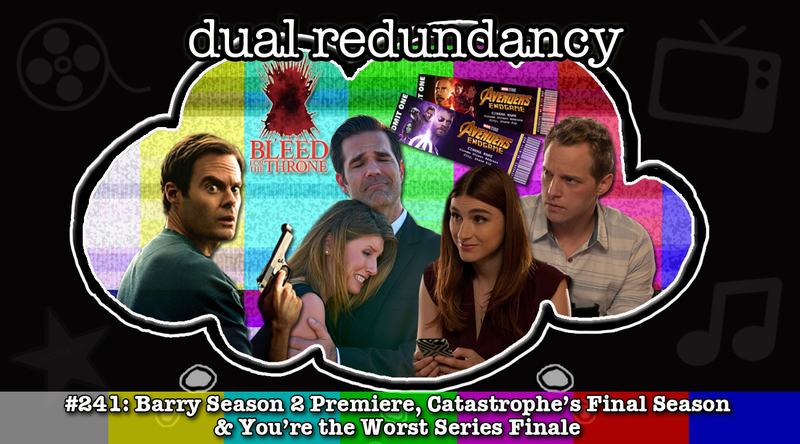 Finally, we review the final seasons and series finales of You’re the Worst (31:00) and Catastrophe (43:35). 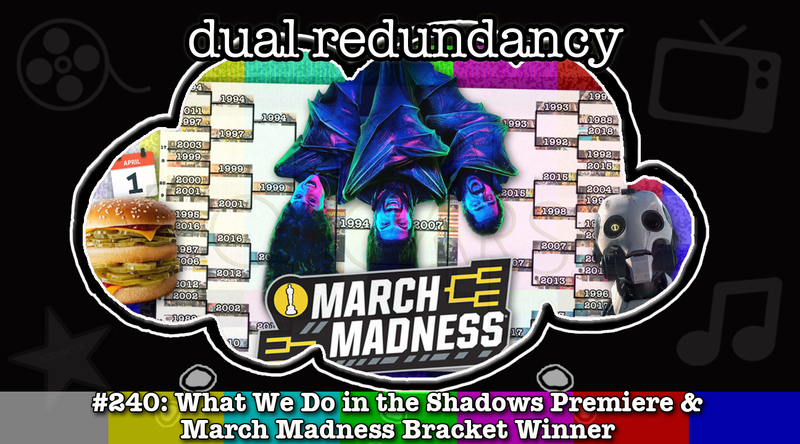 March is over so it is time to end our March Madness bracket. 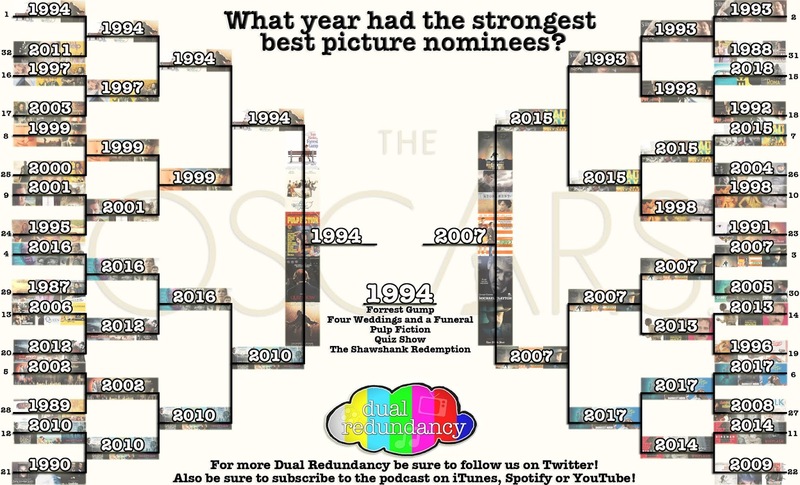 After your weekly votes we finally have an answer to what year had the strongest batch of best picture nominees! How were the seeds figured out? What were the final voting results? Do we agree with 1994 being the winner? Watch the live video reveal below or by listening to episode 240 of the podcast! In this week's episode David, John and Kyle discuss some of the internet’s April Fools’ Day pranks including a bean bag onesie, McDonald’s McPickle and Burger King’s Impossible Whopper (2:05). We also discuss how Netflix may be testing different episode orders for every user (11:45). Next we review the series premiere of FX’s What We Do in the Shadows (19:15). 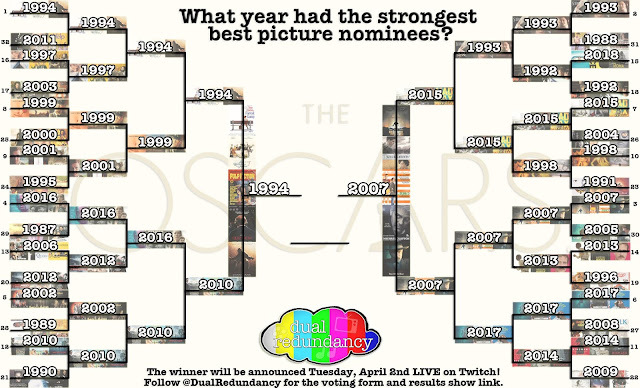 Finally, we discuss the final four years in our March Madness Oscar bracket right before we reveal what year won it all (28:20). You can also listen to past episodes of the podcast on iTunes or on our YouTube channel. Also be sure to subscribe to our Twitch channel! In this week's episode David, John and Kyle discuss the announcements from the Apple Event specifically Apple TV Channels and Apple TV+ (1:45). We also review (with spoilers) Jordan Peele’s latest movie Us (17:25). 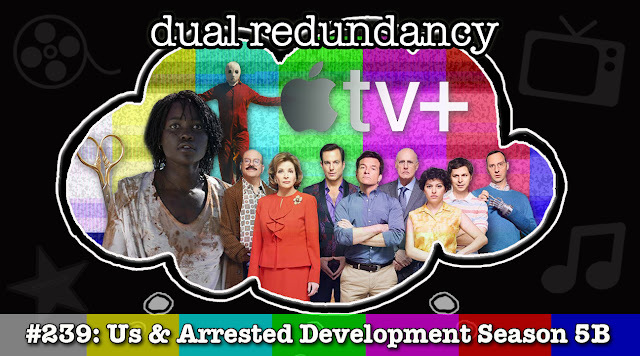 Finally, we discuss the second half of Arrested Development’s fifth (and possibly final) season (36:15). You can also listen to past episodes of the podcast on iTunes or on our YouTube channel. Also be sure to subscribe to our new Twitch channel! 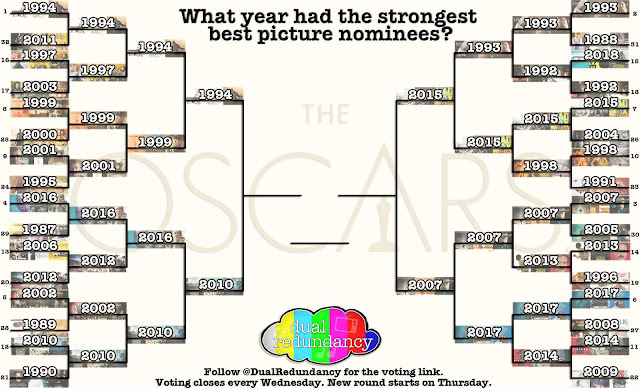 Finally, don't forget to vote in our March Madness bracket where we try and figure out what year the strongest best picture nominees! Every week we will have the best picture nominees of each year face up against each other until only one year remains! Some years have a stronger crop of nominees than others and it is time to finally decide which year The Academy had the “best” best picture contenders. Voting will end on Tuesday, April 2nd and the winner we be revealed LIVE during our Twitch stream at 8 PM ET that night! 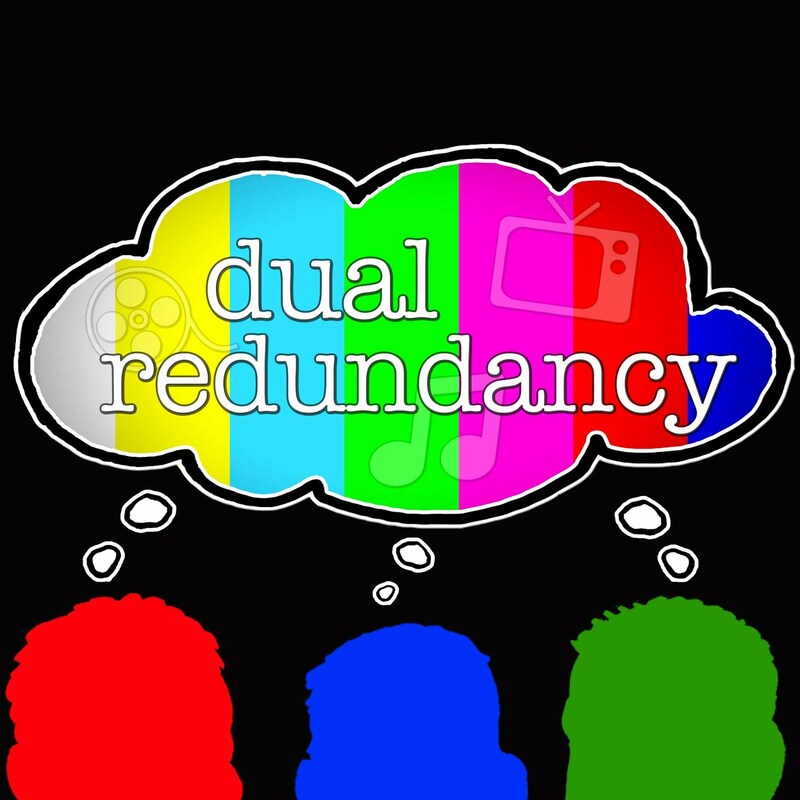 Speaking of voting THE FINAL ROUND HAS BEGUN! Please only one vote per person. In this week's episode David, John and Kyle discuss the runtimes for the last episodes of Game of Thrones (2:10) and how tight security is for Amazon’s Lord of the Rings writers’ room (5:15). We also discuss Netflix’s new interactive series starring survival expert Bear Grylls (9:10) and two new Hulu ads including “pause-vertising” (14:30). 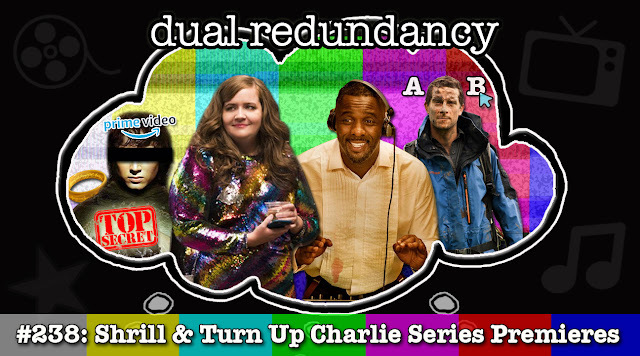 Finally, we review the series premieres of Hulu’s Shrill (23:35) and Netflix’s Turn Up Charlie (31:50). You can also listen to past episodes of the podcast on iTunes or on our YouTube channel. Also be sure to subscribe to our new Twitch channel! Also be sure to vote in our March Madness bracket where we try and figure out what year the strongest best picture nominees!